Azure Mobile Engagement is an app analytics service that allows developers to track their application’s performance helping them increase retention and app usage. Using the Power BI Azure Mobile Engagement content pack you can quickly connect to an out-of-box dashboard, a set of reports and a curated data set, and instantly get insights into how well your app is doing. 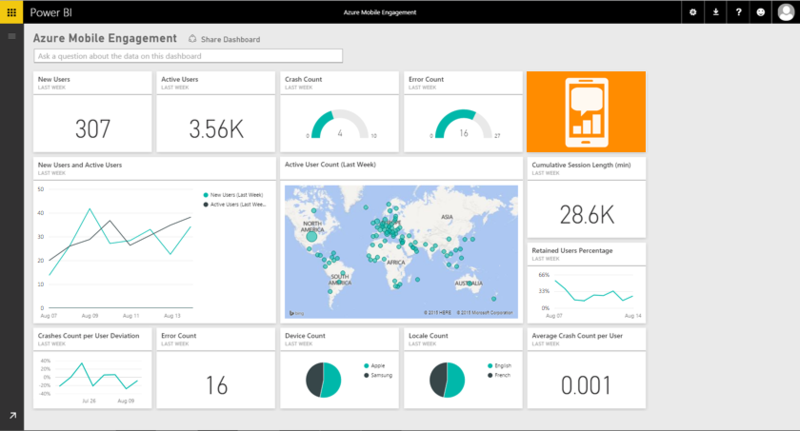 This post will explain how the Power BI content packs helps you explore your Azure Mobile Engagement data. For additional details on how to get started, please see the Azure Mobile Engagement content pack for Power BI help page. To add your Azure Mobile Engagement account to Power BI you need an App Collection, the App ID, and the corresponding API key. To retrieve these parameters, go to the setting of your application on Azure Mobile Engagement. For more information, please see the Azure Mobile Engagement documentation. A dashboard is automatically instantiated once you provide the credentials. The dashboard is a set of tiles each displaying a specific metric to monitor from the dashboard view. Selecting a tile drills in further into a report. For example, selecting the “Active Users” tile will drill into the “Weekly User Report”. The “Weekly User Report” is one of several pre-made reports in this content pack. The other reports included are: Monthly Crash and Bug Report, Weekly Crash and Bug Report, Other Technical Data (Monthly), Other Technical Data (Weekly), Monthly User Report, Monthly User Activity, Weekly User Activity and Map. Each visualization on the reports was chosen to showcase unique insights and highlight important metrics about the data. You can hover over the visualization to see more details. Any of the visualizations from the reports can be pinned to the dashboard, allowing you to customize it to better suit your unique needs. You can also switch to Edit mode while in the reports to view all the fields available. This allows you to edit or add additional visuals to customize your reports and dashboards. After the initial import, the dashboard and the reports continue to update daily. You can control the refresh schedule on the data set. 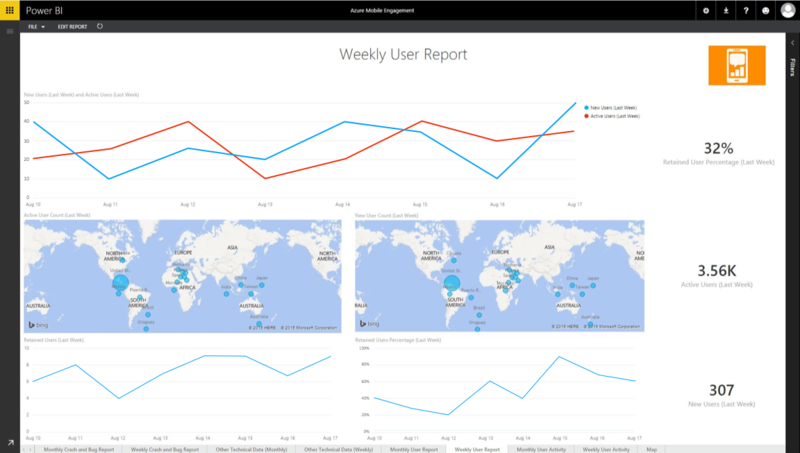 With the Azure Mobile Engagement content pack for Power BI, you have an initial set of metrics and insights allowing you to explore your data even further.